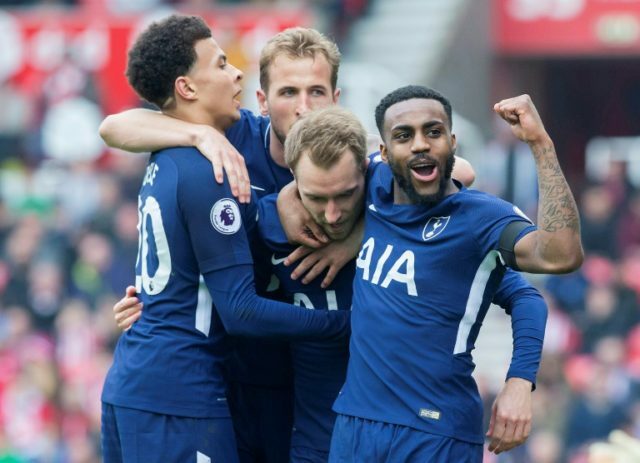 Stoke-on-Trent (United Kingdom) (AFP) – Christian Eriksen scored twice as Tottenham Hotspur clinched a 2-1 Premier League win over Stoke City following Harry Kane’s return to the starting line-up after an ankle injury. Kane thought he had got on the scoresheet for Tottenham after the winner was initially credited to him and television replays appeared inconclusive. However, Eriksen was subsequently attributed with the goal that secured the points for Spurs after his earlier opener had been cancelled out by Mame Biram Diouf. “It was my goal, it flicked off my shoulder and went in,” Kane said. England international Kane was making his first start since he injured an ankle in Tottenham’s 4-1 win over Bournemouth on March 11. He boasts a formidable record against Stoke, with eight goals in four appearances before this game, but looked a little rusty on his return from injury. Tottenham had won their past four Premier League games against Stoke by a four-goal margin — a top-flight record -– although they had to work much harder here. For all their struggles this season, Stoke had a glorious chance to take the lead. The overlapping Erik Pieters skipped down the left flank and teased a low cross into the penalty area for Diouf, only for the Senegalese player’s composure to desert him as he lifted a shot over the bar. The alertness of Stoke goalkeeper Jack Butland to scamper off his line and save at the feet of Son Heung-min after he had latched onto Dele Alli’s intelligent lofted through ball kept the score goalless before the interval. However, there was an inevitably about Tottenham’s approach and just minutes after the restart they carved open the Potters’ defence to take the lead. Alli sprung the Stoke offside trap and rather than pick out Kane, who had his back to goal, slid the ball into the path of Eriksen who, with Pieters trailing in his wake, crisply struck the ball past Butland. Diouf made amends for his earlier miss moments later when he raced on to Xherdan Shaqiri’s ambitious through ball to equalise for the Potters. Spurs goalkeeper Hugo Lloris came off his line only to collide with Diouf and the ball dropped for the dazed striker to roll it into the vacant net. The Stoke striker immediately fell to the ground with a head injury but after treatment from the club’s medical staff was fit to continue. Tottenham regained the advantage just after the hour mark when Eriksen curled a free-kick into the penalty area and Kane appeared to get the faintest of headers to glance it past Butland. The goal was initially credited to the England striker although TV replays were inconclusive as to whether the 24-year-old got a feather of a touch on it and it was later awarded to Eriksen. Stoke almost equalised with 11 minutes to go when Shaquiri’s curling free-kick rattled the crossbar but Tottenham held on to claim the points.